ASU English professor Natalie Diaz "can't not talk about sustainability." Arizona State University has long been a leader in conservation, offering the first comprehensive degree on the concept through its School of Sustainability. The university has worked to engage indigenous communities, with a groundbreaking doctoral program for Native scholars and mentoring and college readiness programs for high school students who grow up on reservations. And it’s become known for cross-disciplinary studies, with faculty and students receiving encouragement and opportunity to merge subjects in search of new ideas. To those ends, ASU has hired a nationally renowned poet who grew up in the Fort Mojave Indian Village near the California-Arizona-Nevada borders and now teaches about sustainability on Native American reservations through her poetry. Diaz is finishing her first semester at ASU and recently spoke to ASU Now about poetry, language, sustainability, the Dakota Access Pipeline and how her days on the basketball court continue to inspire her. Question: You’re a person who has always had a foot in both societies. Reflecting back, what was it like for you growing up on the Fort Mojave Reservation? Answer: Most modern Natives have a foot in both worlds. The reservation is a paradox. It’s a place where we weren’t supposed to survive. But many of us did survive, and it’s one of the reasons why our traditions have been protected. I think there’s a certain honesty that I have with my work and myself. It feels complicated sometimes to make certain negotiations in the business world and even in academia. That has a lot to do with being in the desert, which is in your face and wide open. A lot of people see this as resiliency and strength — yes, that’s true — but the other side that people don’t often see is that there are certain things I’m vulnerable about and that has actually helped me. The fact that I can be vulnerable means that I’m willing to look at things or that I’m willing to ask myself questions where I don’t have the answers a lot of the time. Q: The NCAA tournament just wrapped in Phoenix on Monday. Did it evoke memories of your playing days? A: My little sister is a high school coach and she and her husband both went to the tournament. She texted from the championship game and wrote, “I can’t believe you were here. This is crazy. I can’t even hear myself.” When she said that, I felt it in my body, and there was a flood or charge in my chest when I thought about being there. What I miss the most about basketball is the way you can trust the body in ways in other worlds I move in like literature and academia, those systems of trust aren’t there. There’s a different gauge. In basketball, you always know if you’re doing well. You know if you’re winning or losing. There’s no BS'ing. Basketball makes you honest. I miss the physicality of it but in a lot of ways, that’s how I do my best writing. As soon as my heart rate gets moving, that’s when I have a lot of my best ideas. It’s really the way my body works — it still works as an athlete’s body. Q: Your work as a poet is interesting in that there’s a big focus on sustainability. A: I can’t not talk about sustainability. I grew up on the Colorado River and our tribal name means “The Water Runs Through Our Body and Land.” It’s an awful and strange consideration when the river is gone. What will our name even be? It’s strange to me that there’s so much tension surrounding Standing Rock and the Dakota Access Pipeline because what’s happening there is happening in so many different places around the country. What’s become more visible is the fact that natives have been fighting to keep their lands — many of our lands are the last wildernesses. Look at the Colorado River. It’s got 19 different dams and doesn’t reach the gulf anymore. At some point it will just be agricultural runoff. What non-Native Americans will learn from all this is how to fight for your land. How to fight for your existence in a way that finally feels urgent. It has always felt urgent to indigenous people. It’s always been there for us. We were born into this constant struggle to not just exist or survive, but to live and to flourish. Natives have done this in many ways. What we’re starting to see is just a small ripple but it will continue to build momentum. And it’s going to take all of us — every citizen of the United States — to fight for these things in a way that we’ve never had to do that. It’s going to get much worse before it gets better. Q: Your work with language revitalization is also well noted, but are you seeing signs of success? A: One of the signs of success is do people want to know more about it? One of the toughest things with young natives is they do have a foot in both societies and they live in a modern world where it’s not always encouraged or embraced there. It’s tough to engage a teen in a language they feel doesn’t work on the outside. It has to be able to evolve. For example, if you see a teen texting in their native language, that’s a sign of success. Time is an interesting accordion in language work. I have a teacher named Hubert who I’m now able to have a conversation with in our native language, and one day I was really keen on myself and said, “Isn’t it amazing that in a short period of time we’re able to hold this conversation?” He said, “You’re looking the wrong way. Look at how much you don’t know.” And then, the accordion got smaller (laughs). Q: April is National Poetry Month. What does it mean to you? A: To be honest, it doesn’t mean a lot. I know for everybody else it means we should be listening to poets right now. And for the most part, I do think our country has been listening to poets more as thought leaders and resistors. This shows that language is what determines who you are, what you're against, what you’re for and language has a real energy to it. The American language is very violent and has an awful track record, but it also has the power to do positive things. It can bring people together, it can heal, it’s also how we get all of our ideas. People are looking for places to feel and that’s really what poetry is. It operates under a different time frame, a different power structure. The power of a poem is that for the duration someone reads it, they’re willing to feel something. It doesn’t mean what you’re going to feel is always comfortable but that's how I live. It’s in me and with me all of the time. I don’t need National Poetry Month to tell me I’m a poet. It’s the same reason why I don’t participate in Native American History Month. I’m a Native American 12 months a year. In May 2013, Passey received a Bachelor of Arts in English with an emphasis on creative writing in fiction from the Department of English in the College of Liberal Arts and Sciences. Prior to graduation, she spent three years studying biology at Brigham Young University. After graduation, Passey spent some time as a writer for several different blogs — from fashion to literary journals — while simultaneously writing a book with her sister Lindsey Stirling, an electric violinist who started on YouTube. Passey spent more than a year reaching out to different agents and publishers, but faced rejection letter after rejection letter. In fall 2014, the sisters found an agent who believed in their project and helped clean up their book proposal and manuscript. 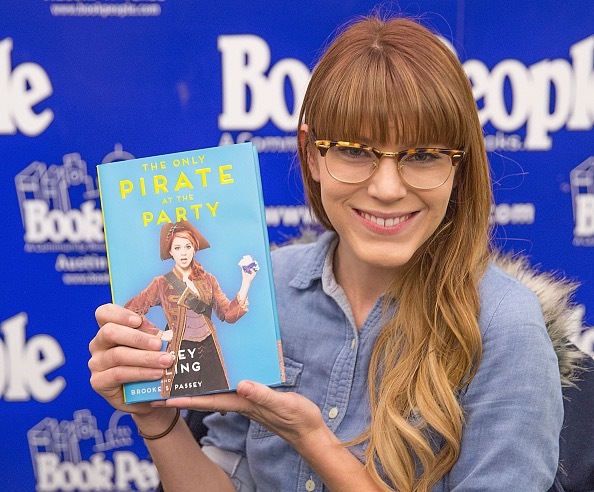 “The Only Pirate at the Party” was picked up by Simon and Schuster in December 2014, published in January 2016, and is currently a New York Times Bestseller. Passey attributes her success to the education she received at ASU. She said she studied under some incredible writers and worked hard to become a professional writer. While writing the book, Passey pursued her second passion for horseback riding and founded Passey Ranch — a privately owned western horseback riding program and boarding facility in San Tan Valley, Arizona. She currently works full-time as an instructor and trainer. Passey also competes in ranch sorting, a fast-paced sport involving cattle, and she spent a few years on a professional rodeo drill team. In the next 10 years, Passey hopes to have another book published. She’s currently working on a nonfiction piece about the relativity of life experience that follows three different characters from different backgrounds.